Pickmeup is an exceptional online cab service provider that has been introduced to ease the stress of movement and travelling around cities and states. Pickmeup has come to compete with other companies that offers the same service but with a different strategy that would strive more. Pickmeup services includes providing comfortable ride experience for passengers and also empowering Nigerians by means of providing employments for efficient drivers. The whole service is powered by an app called the pickmeup app , the app comes in two variants: the passenger's app and the driver's app. 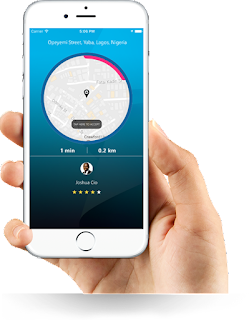 you need and afterwhich setup a location or destination you wish to go to ,you can also get your fare estimate before requesting for the ride . You can be a boss on pickmeup as a car owner , you can work on schedules , also they empower qualified drivers opportunities on driving their cars and balancing them on a basic. Pickmeup charges per kilometre which is far cheaper different from other onlne cab service ,their prices are far cheaper and budget friendly .You pay for kilometre covered which is very fare and reasonable . Pickmeup works 24hrs per day and 7 days a week , they offer 100% user friendly service , they never keep a passenger waiting and they are always ready to provide their service to everyone . HOW MUCH MILE DO PICKMEUP COVER? 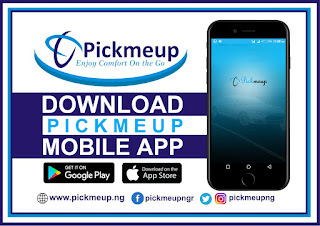 With pickmeup you can journey within your city and outside your state , there is not mile that pickmeup service cannot not cover , be it within Nigeria axis . Pickmeup has almost all asorted types of cars and SUV , they even have trycycle's in good shapes and condition , all pickmeup cars are A.C compatible . WHERE CAN I DOWNLOAD THE PICKMEUP APP? You can get the pickmeup app on google playstore and on apple app store , if you a passenger you can search the store using the word "pickmeup-passenger" and as a driver "pickmeup driver", also the download links to the various app are listed below .